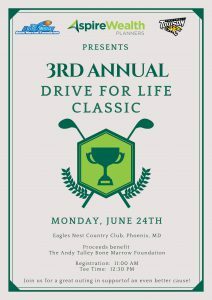 Please join us for our third annual golf tournament at a NEW course in the Baltimore area! Enjoy lunch, golf on a beautiful & challenging course, cocktails in the evening, followed by dinner. A first class event to celebrate and support our mission of saving lives! Hosted by our friends AspireWealth Planners Special guest Rob Ambrose, head coach of the Towson University football team.